The team is made up of me (Helen Bostock), Mark Fenwick (token biologist/NIWA) and two students – Molly Patterson and Courtney Derriman. We have also seconded Jill Scott (one of NIWA’s IT people) to help out when she isn’t required for other IT work. Our main geological roles are going to be mapping the sea floor using the multibeam (see yesterday’s blog post) and undertaking some sediment coring and sampling. The sediments on the bottom of the ocean are made up of sand and mud, which are transported into the ocean from the land via rivers, or blown in as dust. Gravity core being recovered during the TAN0803 voyage. Credit: NIWA. The sediments also contain thousands to millions of the skeletal remains of plankton – tiny microfossils ranging in size from 2μm-0.5mm – which fall to the bottom of the ocean when they die. If they aren’t eaten first, of course. Sediments cores provide an archive of past changes in the ocean. The sediments slowly build up over time, so as we look down the core we go back in time. It’s like an oceanographic time machine. Today we reached our first official station on the voyage, where we attempted a gravity core in the Emerald Basin east of the Macquarie Ridge at a water depth of 3600 m. The core is lowered to the sea floor by a winch on a very long wire, and then driven into the sediment by a large lead weight (approximately 2 tonnes). We recovered a ~4 m core, made up of pale cream, muddy sediment. Unfortunately, the core was also bent – probably due to the stiffness of the sediment – which wasn’t ideal as this made it hard to bring on deck without sloshing it around. We will try a slightly different strategy for our next core tomorrow. Sediment coring is as much an art as a science! Mud doesn’t sound very exciting, but it is made up of billions of microfossils. Changes in the type of microfossils, or the chemistry of the skeletons, along with the size of the grains, are proxies for changes in the environmental conditions in the past. 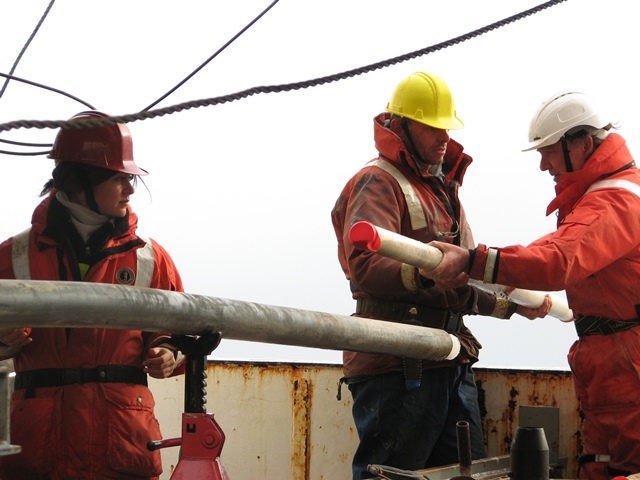 We (my collaborators and I) hope that the sediment cores will provide information on what has happened to the water masses in the Southern Ocean over the last 30,000 years (or longer), covering changes from the last glacial to the modern interglacial. The Southern Ocean is thought to have played an important role in causing these large natural climate transitions, but we still know very little about this region. 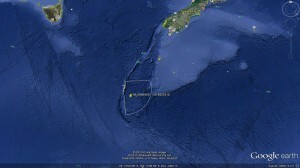 In order to calibrate these proxies we are also collecting some modern plankton during the voyage. The chemistry of the modern skeletons will be compared with the oceanographic data (temperature, salinity, nutrients, pH) from the voyage, to produce a calibration which can be used on the sediment cores back through time. 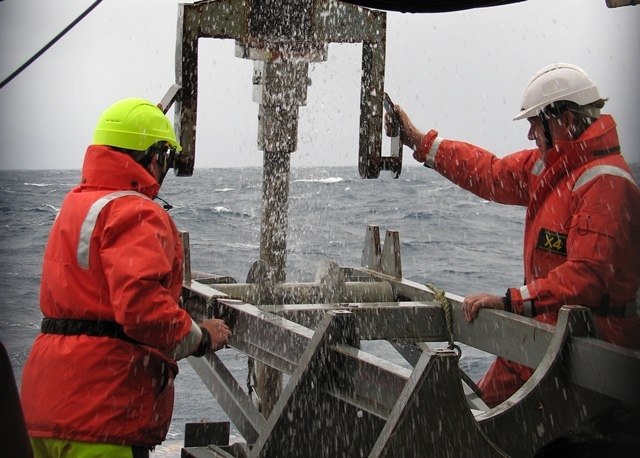 The oceanographers also did their first CTD cast and got some deep water samples for the chemists. Everyone was very excited to finally have some work to do after 4 days in transit. It helps to take your mind off the sea sickness!